ASA is the only association—national, state or local—dedicated solely to improving the business environment for subcontractors in the construction industry. By focusing exclusively on the needs of subcontractors, ASA can target the issues that most impact your bottom line. ASA members are construction professionals—just like you. ASA has 31 local and state chapters across the country and serves as the united voice for all subcontractors, specialty trade contractors and suppliers in the construction industry. ASA is the only organization dedicated exclusively to the business issues affecting subcontractors, who perform more than 85 percent of the work on all commercial construction, in both the public and the private sectors. ASA provides information, resources, education opportunities and contacts to help you run your business more profitably. We’re your advocates, working every day to protect your interests and promote fair business practices throughout the construction industry. Construction generates billions of dollars of revenue annually, but government generates countless laws and regulations complicating the business of construction. ASA is your voice in Washington, D.C. Legislators and decision-makers hear your pointof-view on issues affecting business conditions for subcontractors. Each year, courts across the country hand down decisions on federal and state laws, as well as court-made law, that apply to your business. ASA taps its Subcontractors Legal Defense Fund to fund amicus briefs in appellate-level cases that could have a significant impact on your rights. No other subcontractor association has an active advocacy effort in the courts. ASA webinars provide you with the opportunity to advance your business skills without leaving your office, while education programs offered during ASA’s annual convention, SUBExcel, provide inperson workshops by top-notch speakers and interactive discussions. ASA monitors the everyday workings in the construction industry and Capitol Hill and provides easy-to-read information specifically tailored for subcontractors via a weekly e-news bulletin, ASAtoday. ASA delves deeper into subcontractor issues through its monthly educational journal, The Contractor’s Compass. The ASA Web site provides resources you won’t get anywhere else. ASA’s Subcontract Documents Suite includes a bid proposal form, addendum to the subcontract, a short-form addendum, and additional subcontract documents and is an exclusive, no-cost benefit for members. ASA’s reservation of rights stickers help you preserve your rights during the subcontract negotiation process. All of these documents are available at no cost to members on the ASA Web site at www.asaonline.com. 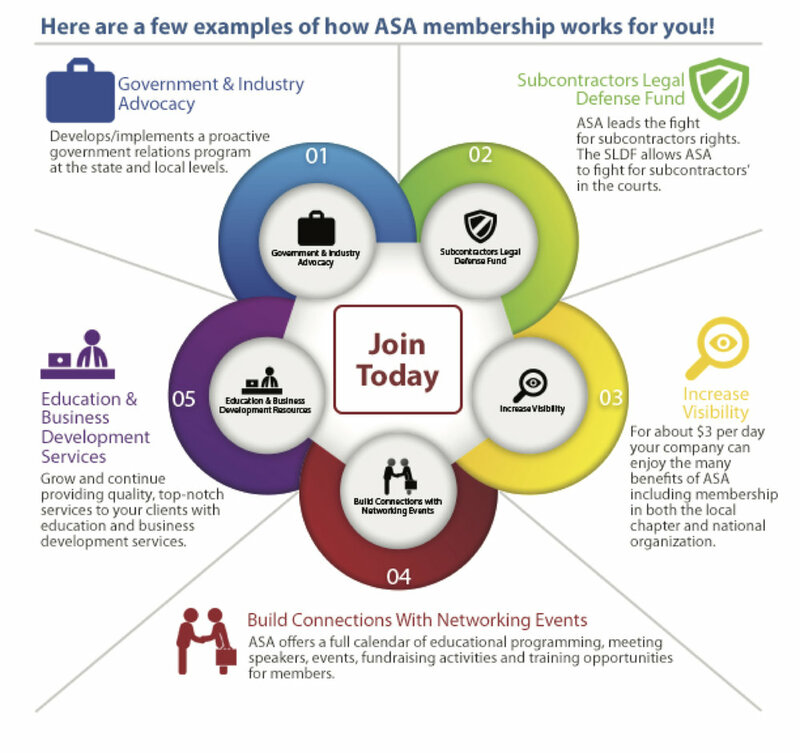 ASA’s online membership directory promotes your company throughout the industry to give your business greater exposure. ASA is your voice within the construction industry, both locally and nationally. ASA is a founding member of ConsensusDocs, which develops model documents that allocate risk equitably among the parties on a construction project. Being active in ASA is a great way to develop leadership skills and play a role in changing the construction industry for the better. Working on an ASA committee or task force is another great way to build lifelong relationships with other members, while contributing to the greater cause! The ASAdvantage program provides access to exclusive offers and discount pricing on project documentation, business services and supplies, insurance and more. By joining the voices of subcontractors and suppliers, you help ASA accomplish the results you want in the industry, your community, and on Capitol Hill.